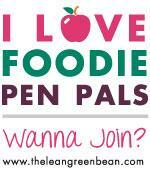 Remember way back in March when I posted about foodie penpals? Well, I signed up for round 2 and I'm so glad I did. I got my second box in the mail and it was AMAZING! For those who don't know what a Foodie Penpal is, it basically is a penpal but instead of snail mail you send some of your favorite foods. Lindsay over at the the lean green bean is kind enough to coordinate this every month - for free! All you have to do is sign up and Lindsay will match you up with someone. After getting to know your foodie penpal a bit and finding what they like, if they have any dietary restrictions, etc. you put a fun goodie box together ($15 max) and send it off. 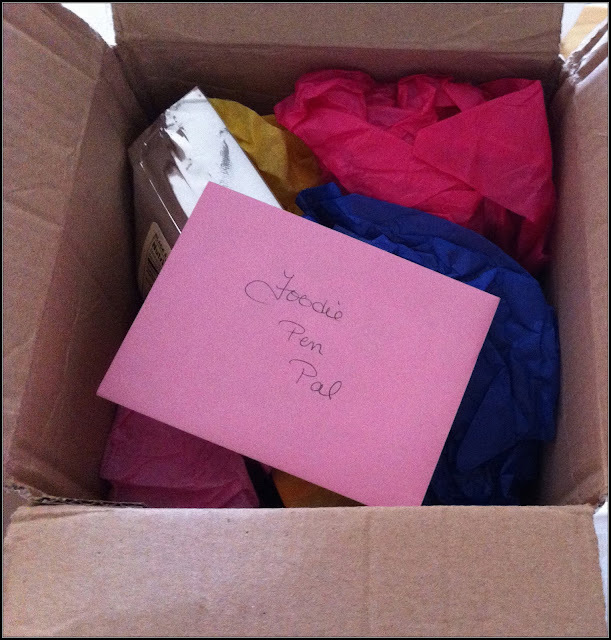 You also have to include something handwritten, which is great because who doesn't love a handwritten card??? This month was my first time to swap in the US and I absolutely loved what I got. Opening packages in the mail is oh so fun and I can never tear packages open fast enough. 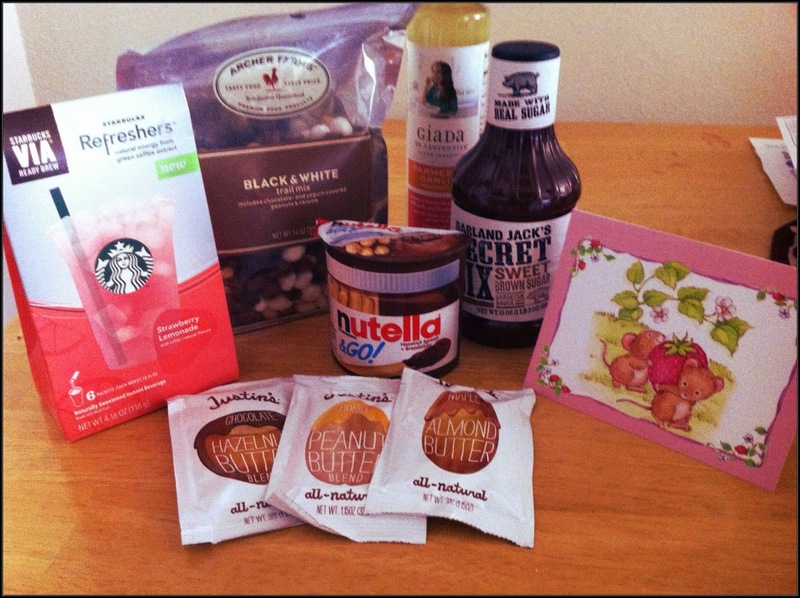 Audrey who blogs over at Exposed: On My Way to a Better Me sent me an amazing package of goodies. I love that each item was individually wrapped to. It made it all the more fun! Check out all these amazing foods in my box. Starbucks strawberry lemonade refreshers. This is a fabulous drink. I never would have thought to buy some for myself (until now that is) so I'm glad Audrey sent me some. I'm looking forward to buying more and trying out the different flavors offered. Black & White trail mix - um, no words to describe how good this is. Dave is trying to help me eat healthier and the other day he told me I shouldn't eat a cookie. I said 'ok' and snuck my little self right over into the kitchen and secretly ate a handful of this trail mix. I know ... that kind of defeats the purpose of him helping me eat healthier but trail mix is healthier than a cookie right??? Giada Parmesan Garlic salad dressing - y.u.m. Nutella to go - what's not to love about that??? Garland jack's sweet brown sugar bbq sauce! Justin's Chocolate hazelenut butter, honey peanut butter and maple almond butter - I'll be scouting out Woodward for this and if they don't have it I'll be scouting out Amazon. These peanut butters make you want to dance and sing. They really do. They are also all natural so if you have never tried 'em you should do so soon. Also, they must really be amazing cuz I don't care for peanut butter too much. Thanks Audrey for my delicious food box. It really is a great experience and I highly highly recommend it. To find out all the details just click below. Wow, this looks like so much fun! I think I'll sign-up, too :) Thanks for sharing the link/info.